There are dozens of comic book conventions around the United States each year, drawing tens of thousands of visitors from cities near and far. Later this month, an estimated 130,000 people will travel to Southern California for the long-running, iconic Comic-Con International: San Diego. In October, more than 150,000 will visit New York Comic Con, with many more in between, in cities from Vancouver, British Columbia to Raleigh, North Carolina. 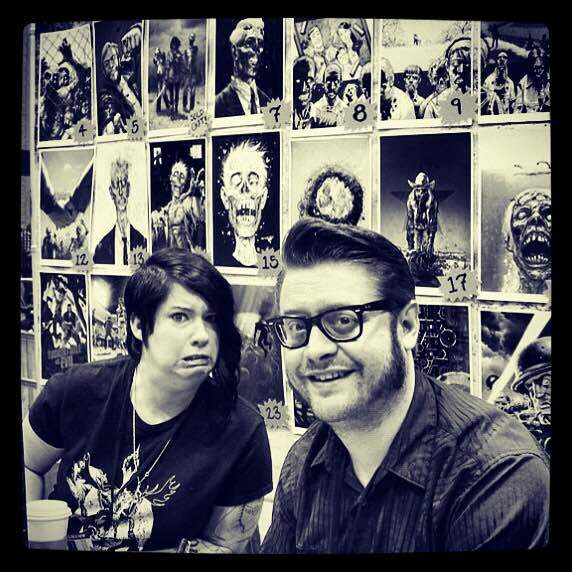 Tony and Kara Moore are a comic book power couple who estimate they’ve traveled to more than 100 comic book conventions over the years. Tony is an Eisner Award-nominated artist and co-creator of The Walking Dead and Battle Pope. Kara is Tony’s wife and business manager. At their peak, they’ve averaged 12-15 conventions per year and today co-own and operate a “con” of their own with two partners. In the Q&A below, the Moores talk cons and offer insider tips for attendees of all levels – from comic con “newbs” to autograph-gathering pros. Do you have a favorite convention? They’re all our favorite! Ha! No, obviously some shows are run better than others but our favorite show is probably Cincy ComiCon. It’s the Cincinnati show that Tony and I co own and co-operate with two other partners. It’s intimate, with no filler of washed up actors and wrestlers – just pure creative content. Plus, we work hard to make sure everyone is happy. 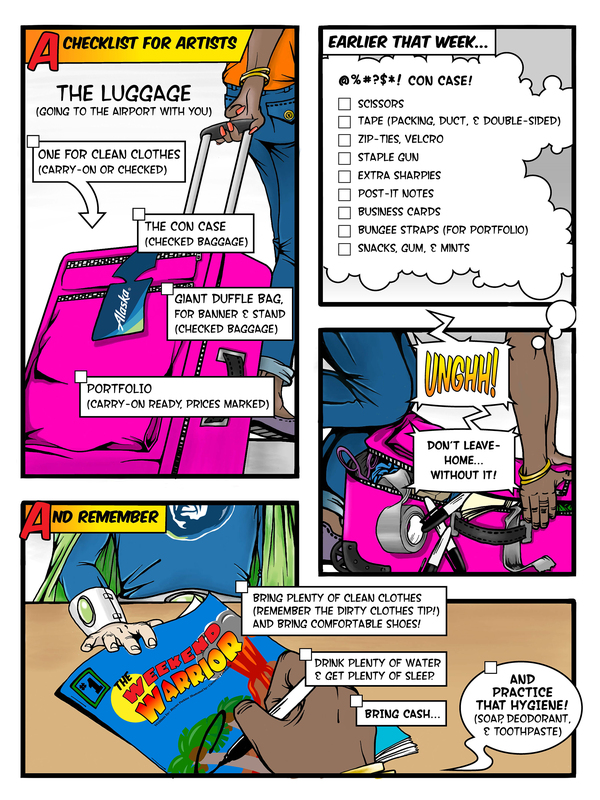 Starting out, did you travel with your portfolio? Any lessons learned, if so? Yes! The first show we ever attended together was Comic-Con International in San Diego back in 2004. We had a few portfolios of artwork with us to sell from. The best advice I have is to take it as a carry-on, and once you arrive, make sure you bolt them to the table. Have your pieces priced, too, because most people are too shy to ask. What do you do to pass the time on flights? Sketch? Read? Any books that have caught your eye recently that people should pick up before their next flight? Normally we’re up super, super late the night before a convention, tying up any loose ends that we have forgotten. So when we get on the plane we sleep – Tony especially. As for something to read on the plane? Southern Bastards by Jason Aaron and Jason Latour is my top book at the moment. 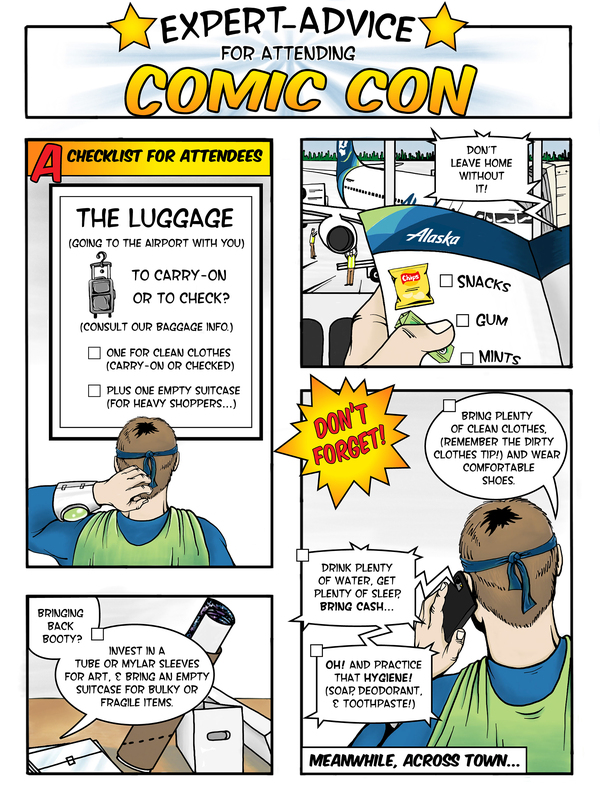 You guys are con experts by now – what are a few things that you won’t leave home without? We never leave home without our con suitcase. It consists of scissors, tape (packing, duct, and double-sided), zip ties, Velcro, post it notes, business cards, bungee straps (for the portfolios), staple gun, snacks, gum, mints, extra sharpies and more. I imagine you’re often hosting tables and sitting on panels – how much luggage do you have to roll with? We always have our con case, at least one with nothing but clothes, and a giant duffle with our banner and stand. Those are the ones we always check. Sometimes Tony will have his giant backpack full of art, but that’s always a carry-on. That’s what we take to the airport. For all other merchandise we use a logistics company and ship everything to the show on a pallet. Any tips for first-time con attendees? What are a few things they might be surprised to find they need or should be thinking about? So many tips! Bring plenty of clean clothes and don’t throw your dirty ones on top of your clean ones at the end of the day. It gets hot and sweaty in there and no one wants to smell you. Drink plenty of water, get plenty of sleep, and make sure you have comfortable shoes. The convention floors are concrete and you’ll be doing a ton of walking. Bring cash because the line at the ATM is always much longer than you think it will be, and some booths aren’t set up to take credit cards. And for sake of everyone around you, general hygiene. Use soap, deodorant, and toothpaste. Schwag and souvenirs – any tips for transporting art and collectibles back home? Anything you should avoid? If you’re getting some printed art it’s always a good idea to invest in a tube or some Mylar protective sleeves. These will keep the paper protected. Breakable items (like coffee mugs) are heavy and tough to transport back. Plus, can’t you buy all that stuff online any day of the week anyway? If you’re really concerned, bring an empty suitcase with you for all your goodies. What’s your favorite thing to do outside of a convention? We are usually pretty dead by the end of the day, but we always make sure to take at least one night for a really nice dinner just the two of us. Things can get hectic and it’s really nice to unwind at the end of the day. What’s the best cosplay (costume play) outfit you’ve ever seen? There was an amazing Fear Agent cosplay that we saw in Canada. This guy had handmade everything including the rocket pack on his back. It was so great! Probably Electro from San Diego Comic-Con. This guy had real live electric sparks and everything. It was so crazy! I don’t know how he wasn’t shocking himself or those around him.